Today, Cambodian people and their children are wiping tears in front of bloody body of Dr. Kem Ley who is an academician and social analyst. In broad daylight of July 10, 2016 at around 9:00am, gun man walked bravely to shoot Dr. Kem Ley to death inside a Caltex gas bar in the heart of Phnom Penh city. 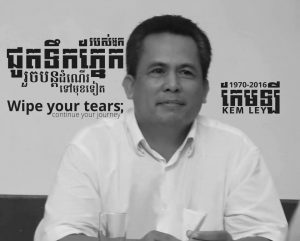 Dr. Kem Ley is the first remarkable higher education researcher is shot to death after trade unionist Chea Vichea, environmentalist Chhut Vutthy, actress Piseth Pillika, journalist Chou Chetharith and Khem Sambo, etc. were gunned down in broad daylight with tantamount public evidence of impunity. ៚More than 14 million Cambodian people could not be living within this high stake of life intimidation while few upper-hand echelon are free to conduct gangster-styled leadership through these most recorded-killing lists of impunity. ៚Cambodia needs to demolish gangster-styled leadership by bringing those responsible entities to step down from power so that impunity is not a bombarded threat to life security and daily living of all Cambodian people. ៚Cambodian people and youths have learnt great lesson and experiences on how danger excessive paranoid leaders are remained existing in Cambodia?